Richard W. Kiel, 89, of Saint Marys, died Saturday, January 19, 2019, at Grande Lake Health Center, Saint Marys. He was born November 28, 1929, in Fort Wayne, Indiana, the son of Arthur and Edna (Haugh) Kiel. He married Constance “Connie” Goodrich on June 27, 1953, at Zion Lutheran Church, Ft. Wayne. She survives at the residence. He is survived by his children: David (Dorothy) Kiel of Saint Marys; Susan (Karl) Lengerich of New Knoxville; Gregg (Lisa) Kiel of Elida. He is survived by five grandchildren and two great-grandchildren. He was preceded in death by his parents; by his sister, Carol Wagner; by a brother-in-law, Paul Goodrich. Richard was a 1948 graduate of Fort Wayne Central High School, and a graduate of Purdue Tech. He served in the US Air Force during the Korean War. Richard retired from the Minster Machine Company after 35 years of service as an engineer. He enjoyed woodworking, and donated many hours helping to build the covered bridge in Saint Marys Memorial Park. He also enjoyed working on puzzles, bowling, fishing and gardening. He was a member of Eagles Lodge 767. 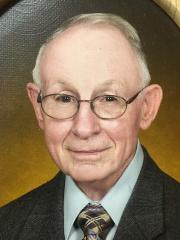 He was an active member of Zion Lutheran Church, where he had served on the church council and numerous committees over the years. Funeral rites will be held 10:30 A.M. Friday, February 1, 2019, at Zion Lutheran Church, the Reverend Bill Maki, officiant. Burial, with military honors, will follow at Elm Grove Cemetery, Saint Marys.